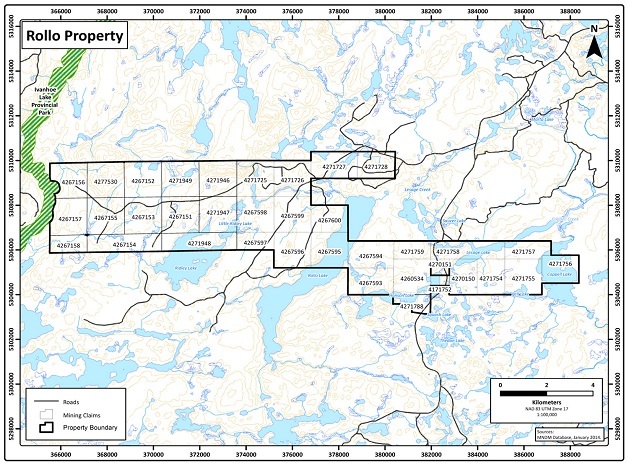 The Rollo property is situated within the Destor-Porcupine fault zone, which hosts several million-ounce-plus gold producers in the nearby Timmins camp, and sits between Iamgold's Cote Lake gold deposit and Probe Mines' Borden Gold project. Initial targets will center around a similarity in composition of Quartz Feldspar Porphyries between the Rollo property and Timmins. The property is located in the western portion of the Swayze Greenstone Belt of the Abitibi Subprovince, which is host to numerous significant gold occurrences and past producing mines. The project is essentially a grassroots exploration project on a relatively under-explored property, and is based on the concept that the property has the potential to host greenstone-hosted quartz-carbonate gold mineralization similar to that found locally in the area of the Property, elsewhere in the Swayze Greenstone belt and in many other important greenstone belts in the Superior Province. Very little exploration has been done on the Rollo Property to date, with the work being done consisting primarily of airborne geophysics and some prospecting. The geology on the Property as indicated on OGS map P. 3331 (Wilkinson and Harris 1995) and Thurston et al. 's map P. 673 indicates that it is underlain primarily by mafic to intermediate metavolcanics, with numerous granodiorite to granite intrusions up to about 3 km in diameter. A number of roughly northsouth trending faults have been interpreted to cross the property in the central portion of the property, and some of the geophysics performed has suggested additional faults and shears at various orientations.